SINCE the new government of prime minister Yingluck Shinawatra took office last July, Thailand has been treated to a soap-opera about the supply of tablet computers to all children starting school. Ms Yingluck’s “one tablet per child” pledge during the campaign was probably her single most vote-catching policy, yet fulfilling it has turned into a national ordeal. A few weeks ago a deal was at last signed with Shenzhen Scope Scientific Development, a Chinese firm, for the provision of 400,000 tablets. On June 7th a beaming Ms Yingluck gave the first batch to a group of smartly dressed pupils. 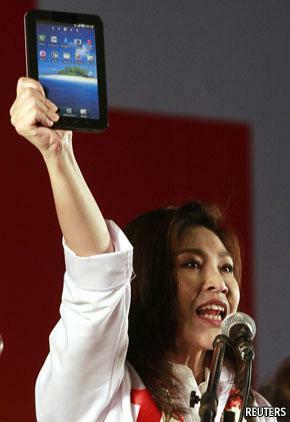 Some argue that the focus on the tablets has distracted attention from a deeper malaise affecting Thai education. Although the proportion of children attending school has grown over the past decade, the quality of their education has deteriorated. The chief problem is that children’s educational attainments are falling, even as more money is being lavished on the schools. Thailand now spends about 20% of the national budget on education, more than it devotes to any other sector. The budget has doubled over a decade. Yet results are getting worse, both in absolute terms and relative to other countries in South-East Asia. Thailand’s own ombudsman reported earlier this year that, despite the extra cash, the national standardised examination results show that students’ scores in the core subjects of English, maths and science have been largely falling. The most recent Global Competitiveness Report from the World Economic Forum ranked Thailand a dismal 83rd in terms of its “health and primary education”, one of four basic indicators. This is below others in the region such as Vietnam and Indonesia; only impoverished Cambodia performs worse. Thailand’s scores on the respected international PISA test have remained almost static since 2003 whereas Indonesia, for instance, has been moving up from a lower base. In another recent competitiveness report Thailand ranked 54th out of 56 countries globally for English-language proficiency, the second-lowest in Asia. For a relatively affluent country that wants to escape the middle-income trap, such statistics are depressing. Employers lament that they have difficulty hiring people with basic reading and writing skills. As a result, positions often go unfilled, or insufficiently qualified people have to be taken on. Productivity suffers as a result. Why does Thailand fare so badly? Somkiat Tangkitvanich, an expert at the Thailand Development Research Institute, claims that there is no mystery. Most of the swelling education budget has gone on higher pay for teachers (who now often earn more than the starting salary of a university lecturer), yet no improvement in performance has been extracted in return. Others suggest that bad schools could be closed, or turned over to the private sector. These are radical ideas for a conservative country and would mean taking on powerful vested interests—not least 400,000 or so well-paid teachers. Giving every child a tablet computer is a nice gimmick, but it is unlikely to be the key to educational excellence. That should keep the kids out of the Internet shops. Great idea. ^probably will, given that the schools are getting internet at over 100 times the speed of you average internet shop. As far as I know not a one yet mate. Not even the universities. Its all a golden promise, but not given out at retirement. Its all a bunch of BS. ^^They have in the process of rolling out a 10Gbit fibre network to 7000 schools with each school getting at least 1GBit in to the school. ^I hurd that too. but when they vibrate to the correct answer on the exam paper they get out dear leaders double upset about them. where did you get the idea from hazz that schools get fast internet never read so much rubbish , at my school internet is so slow you cannot look at videos on you tube or any where else for that matter some times i wait for minutes to open websites.